With the infusion filters and complete filtration systems, our sets standards in infusion therapy. As always, patient safety, simple handling, flexibility in use and cost-consciousness are in the foreground, especially in such a sensitive area as infusion therapy. Produced and equipped for administration of cytotoxic drugs in chemotherapy. Made of DEHP free PVC for complete patient’s safety. With 0.2 Micron filter and check valve for administration of cytotoxic drugs. Sterility guaranteed for 3 years if stored under proper conditions and Package is undamaged and unopened. Sterile by E.O ready for use. Push piercing device into the solution container. Squeeze and release drip chamber until primed to the level mark. Open flow regulator and prime the tubing system. Ensure that all air in the tubing system and inline filter is eliminated by holding it in a vertical position during filling. Close flow regulator. 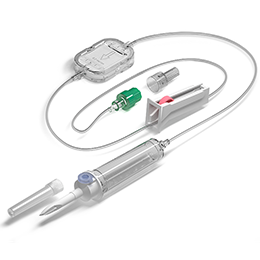 Connect luer lock positive to vein puncture device. Open flow regulator and adjust to desired drip rate. NO DEHP, Vented, with integrated 0.2 micron inline filter, for infusion of parenteral drugs. Gravity feed only. Not for fat solutions or blood components. unless package is damaged. Do not use if protective caps are loose or displaced. 20 drops distilled water 1 ml ± 0.1 ml. Pyrogen free.